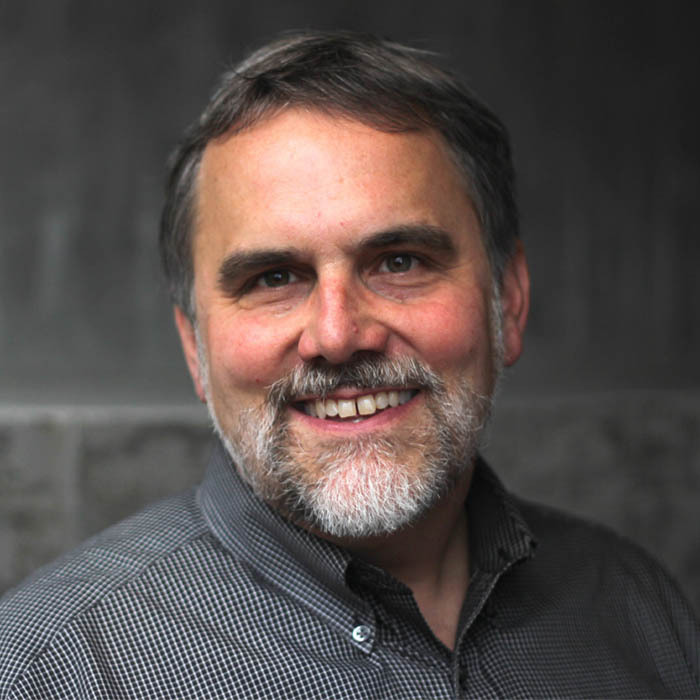 A Q&A with Brad Liljequist, director of the Zero Energy Program at ILFI. Brad Liljequist, Zero Energy Director for the International Living Future Institute (ILFI). The net-zero-energy building market has come a long way since the first commercial projects to target net zero were constructed nearly two decades ago. They include the Oberlin College Adam Joseph Lewis Center for Environmental Studies in 2000 and the Audubon Center at Debs Park in Los Angeles, which earned a LEED Platinum rating in 2003. Today, the International Living Future Institute (ILFI) has certified 64 projects, with another 426 in the pipeline. The latest numbers from the New Buildings Institute (NBI), from 2016, total 53 verified projects, with another 279 buildings and districts “emerging”—meaning they’re working on meeting the goal of net zero. Brad Liljequist of ILFI describes his job as “trying to make zero energy buildings the norm.” Liljequist talked with BuildingGreen about the current and future state of the net-zero market. Recently, Grand View Research Inc. forecast $78.8 billion of growth in the global net-zero-energy building market by 2025. That’s compared to $8.04 billion in 2016, according to the report. What do you think of this analysis? Setting aside the literal ‘is the right number X or is the right number Y?’ the reality is we are really seeing a quiet revolution in the design and technology since undertaking a lot of what I think of as zero-energy design; it is an all-electric building, it has a substantially improved envelope, it tends to have a separated ventilation, and heating and cooling systems … and better daylighting so their lighting loads go down. The heating, cooling, and hot water systems are heat-pump based. I think zero energy as an idea is helping to drive a technological and design transformation, and that industry is massive. And I also think what’s going to end up happening, as the technology uptake occurs, it’s going to get cheaper and cheaper, and it’s going to make zero-energy buildings truly more the norm. Over the long haul, the numbers the report is talking about … are absolutely going to happen. Who knows what year that will be, when it is $80 billion dollars. We’re in the middle of the transformation right now. You do believe it’s a multibillion-dollar industry? King Street, JW Architects' office building in Seattle, is a Zero Energy Certified building (Living Building Challenge certification in 2017). If you look at the California market alone, California has a policy to codify net-zero-energy residential by 2020. Now, how they will actually do that and how it’s actually defined, I think there’s a big question mark around that, and we’ll see what it actually is. But even if you just take that fact alone and multiply it broadly, yeah—I do think the market is going to be that big. Just in the last few months, we’re seeing a big uptake in Zero Energy-registered projects [at ILFI]. Our customer service inquiries, this is kind of anecdotal, but they are really going up. We are just having a lot of people contact us and many, many conversations. Last Friday alone (December 15, 2017) we had five projects contact ILFI to register. Can you compare the U.S. and Canadian markets versus the European and Asia-Pacific markets—which of those is largest and why? I think ‘zero energy’ is mostly an American definition, although some of the original concepts originated in Europe. As an idea, where it’s gotten the most traction, has been the United States. But I think just because they are not necessarily using that terminology, I mean the market for high performance buildings is by far the strongest in Europe. I mean they are five to ten years ahead of us. 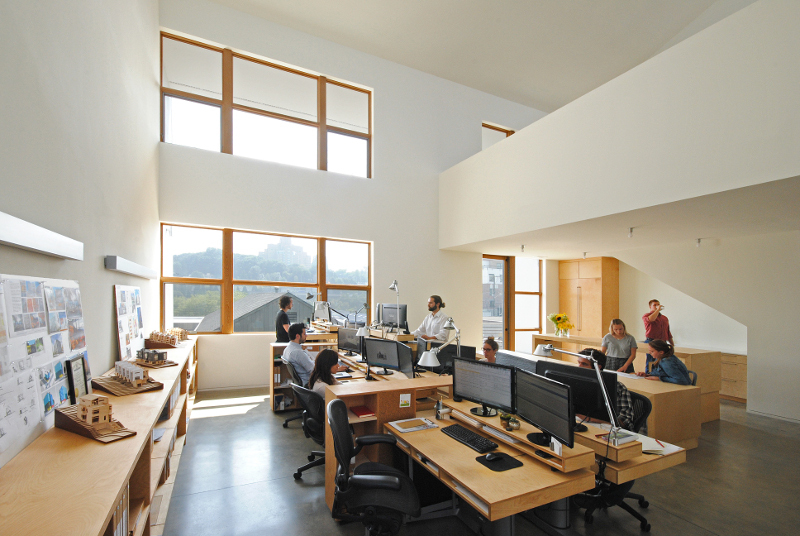 The interior of King Street, JW Architects' office building in Seattle, a Zero Energy Certified building. I think they see the climate crisis for what it is; it’s a threat to civilization. And they’re mounting a serious response to it. They’re implementing policies at a central government level to actually make the change happen. The U.S. is really great at primary technology, like coming up with initial ideas…. The Europeans and the Japanese have a demonstrated track record for being able to bring to market substantial technology improvements. Whether it’s high-performance windows, the best HRV [heat-recovery ventilator] technologies, Passive House design and the materials to go with it … those are coming from Europe. And I think the Japanese really led the way on the best heat pumps. We kind of lag. Those things originated in those locations; they’ve had market adoption that’s just ahead of ours. Our federal government is not leading us with laws that would push zero energy? I think that’s accurate. Right now, within the United States the leadership is coming from localities and states. And there’s a beauty to that. You get competition. The reality is if you have a strong, central authority just kind of lay down the law and say this is how we are going to do it, it makes a huge difference. What about the growth of commercial net-zero projects versus residential in the U.S.? Which is experiencing faster growth? I think it’s 50/50. The value proposition is equally strong in both. That’s borne out in the numbers for our registered projects, of which we have 426 at this point, and it’s pretty evenly distributed across all the different development types. Do you think one or the other will have a higher growth rate in the future? I really expect the rate of growth to be the same. If I were going to identify any submarket, it would actually be the institutional market because there the math for zero-energy buildings just is the most compelling. By institutional, I mean public buildings and other long-term owner-occupied buildings. They could easily be corporate buildings or a family-owned business that might really expect to be in a location for a long period of time. Let’s say you are building a new city hall or a new library. It’s typically a building that’s of a high standard. It’s an icon of the community. They want it to be well built. They typically are going to issue a bond for it. So they have a fairly long-term repayment time frame, maybe 20 to 25 years. And if you look at the total cost of ownership, under that ownership structure, a zero-energy building will almost always have a lower total cost of ownership because of the utility savings. The utility savings, over that amount of time, easily offset the increase in construction costs. And college campuses as well? Absolutely higher education. I’m glad you raised that. I actually think higher education might be the biggest growth market because it’s so aligned with the values. We have campuses going through divestment from fossil fuel companies. They are very aligned with the exact same set of values. As we go forward, where do you think we should be focusing: individual buildings or communities? 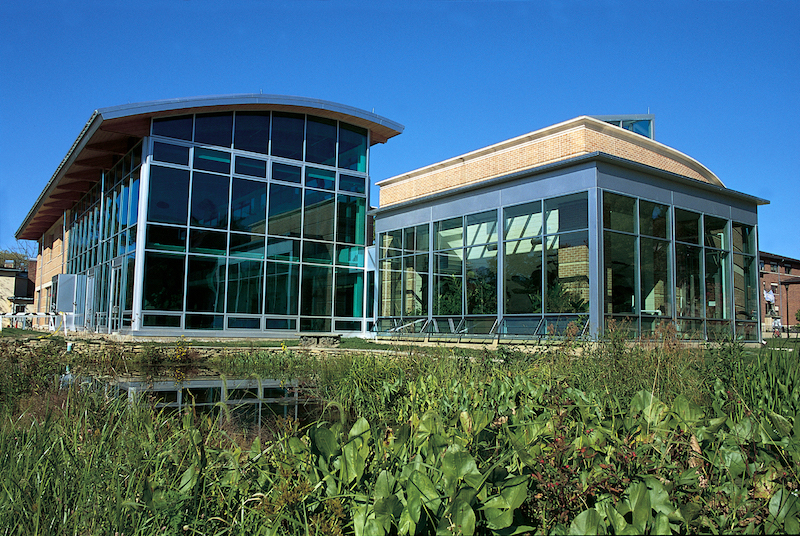 The Adam Joseph Lewis Center for Environmental Studies at Oberlin College in Ohio is a zero energy building. The whole orientation that individual buildings don’t matter is kind of missing the point. Of course, a single zero-energy building is a tiny drop in the bucket, but these early zero-energy buildings are, to me … they’re beacons of hope. They’re showing people what is possible. You’re putting the change you want to see out in front of everybody. At ILFI, we strongly believe in these early prototypes as a way to really catalyze attitudes and understanding. So, yes, the community scale is what’s most important, and even bigger than that, everything is more important, but you’re not going to get there in one fell swoop. It’s a series of actions, and we believe pretty strongly one of the first actions is building prototype examples. I think we need to continue to build the examples, and we need to build them in every state, in different climate zones and in different building types. 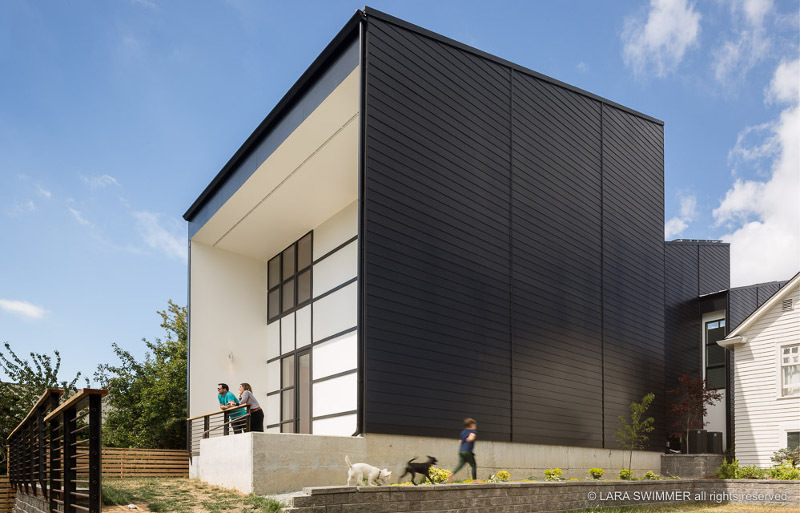 My hope is that zero energy starts to become a household name on par with Energy Star or LEED. And also, parallel to that, we are starting to see early pioneers start to codify it; California, for example. And Washington, D.C. is putting together Appendix Z, which is basically their zero-energy stretch code. As someone who is working to make net-zero buildings the norm, what was your reaction when you saw the recent analysis forecasting the market will be close to $80 billion by 2025? I think there is this other part, that is the wild card, that the report doesn’t address and can’t really address. And nobody knows when this will happen, but I do think we will, in the next five years, hit some type of tipping point where there is a rapid realization that we have to rapidly accelerate this technology solution. I don’t know if some huge part of the Greenland ice sheet is going to fall into the ocean, but it’s going to be something—some kind of catalyzing event. It could be a stock market crash, where everyone realizes fossil fuels are doomed … and there is a reconfiguration of a market. I don’t know what it is, but there will be something that says we have to radically rebuild our buildings and essentially get them to zero-energy performance, and when that happens, $80 billion is going to be small potatoes. Net-Zero Energy Buildings (NZEBs) Market Analysis by Equipment (Lighting, Walls & Roofs, HVAC systems), By Services, By Type, And Segment Forecasts, 2014-2025 by Grand View Research, Inc.